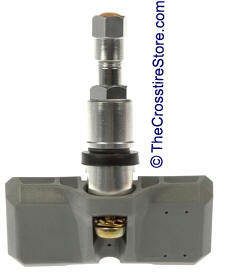 Designed specifically for the Crossfire to ensure maximum protection. 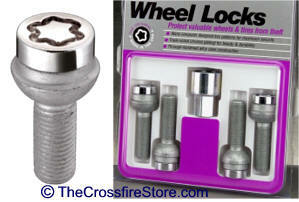 Each wheel lock kit includes as needed set includes four chrome-plated locking nuts, one exclusive Mopar key, Crossfire exclusive, for Mopar and production alloy wheels only. Complete set one lock for each wheel and key. 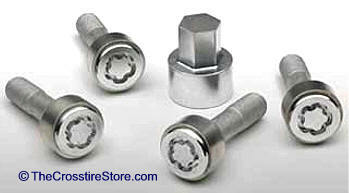 Wheel lock kits help protect against wheel and tire theft without affecting your wheel balance. Tire Pressure Monitoring System Sensor goes inside the tire. One located inside each tire. OEM Wheel. Choose front or back and refurbished. 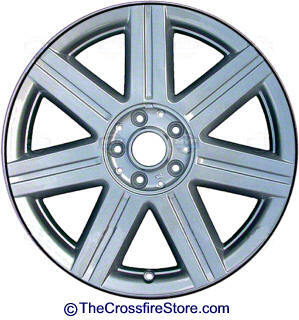 Refurbished is a good condition used wheel that is refinished to look like new again. 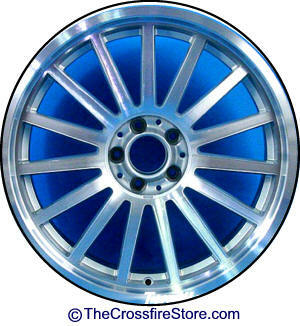 Fronts are 18" x 7.5", Rear are 19" x 9". 5 Lug, Aluminum wheel. OEM Wheel. Choose front or back and refurbished or new.